I wrote about Angel Food yesterday because it seems to me that it's the basis for a number of Demeter's other bakery scents. Some of them, as I noted recently, seem to have a distinct coconut undertone that doesn't belong there. Maybe it's just my faulty nose, but Croquembouche is one of them. A croquembouche is a French pastry made of tiny cream puffs dipped in caramelized sugar as a kind of glue and piled into a pyramidal heap. (The name is from "croque en bouche", "crunches in the mouth".) 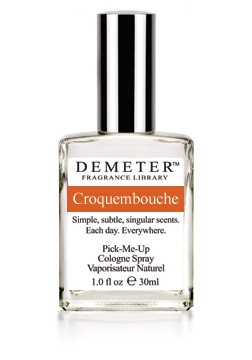 A scent called Croquembouche should smell mostly of bland cream-filled pastry and caramelized sugar, right? Knowing what it ought to smell like, I keep looking for that caramel-pastry-vanilla scent and not finding it. Last night I put on a splash of the scent, and thought, "Oh, wait--is that the caramel?" But it wasn't, not really. I can convince myself, a little, that it sort of smells kind of like caramel (or Caramel) pastry, what with the vanilla and the sugar and the bakery quality, but it still smells like sweet coconut cake to me. Still, you know, if you have to smell like something, you could do a whole lot worse than coconut cake. Just so you're not expecting to smell like a glazed French cream puff.